The IJJO organized the First Meeting of the Asia-Pacific Council for Juvenile Justice “An Asia-Pacific Strategy on Juvenile Justice”, with the support of the Department of Juvenile Observation and Protection of the Ministry of Justice of Thailand. The meeting took place on the 14th of June in Bangkok and was part of the National and Regional Conference: ‘Towards comprehensive and effective Juvenile Justice System in Thailand and the Region’ which took place on the 12th 13th June. The objective of this meeting was to translate the know-how and experiences shared during the debate into concrete actions and documents which can be used for advocacy purposes as well as for the training of the judiciary and law enforcement officials, civil society and community based organisations. The Asia-Pacific Council for Juvenile Justice brings together representatives of public administrations, universities and civil society, all of them with expertise in legislation, implementation, supervision, research or intervention in the field of juvenile justice. 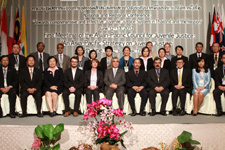 More than 20 countries of the Asia-Pacific region were represented in this meeting. The APCJJ is unique in its nature because is composed by individuals with different background, such as judges, university researchers, practitioners, ngos representatives, international organizations delegates, public authorities and representative of National Commissions on Human Rights. A wide range of different topics were discussed by the experts, such as for instance: juvenile delinquency tendencies and prevention programs in the region. The APCJJ members also talked the subject of how to promote child-friendly justice as well as the professional and social inclusion of young offenders. The APCJJ meeting ended with a field visit three Thai Juvenile Justice Facilities, on the 15th of June, as an example of sharing common good practices on intervention with children in conflict with the law. The IJJO would like to raise the opportunity to thank the Department of Juvenile Observation and Protection of the Ministry of Justice of Thailand for their collaboration and professionalism in the organization of these meetings and to all the participants of the First APCJJ meeting for their interest shown in the Council’s mission and activities. Conclusions for the First Meeting of the Asia-Pacific Council for Juvenile Justice. “Towards an Asia-Pacific Strategy on Juvenile Justice"